Remember when I said that we’d do a tutorial today come heck or high water? Well, the Fates found my hubris to be a little too inviting and have struck us down. We’re going to try again tomorrow, when Sandy Kay will (try to) bring in her sewing machine. Keep your fingers crossed, since it seems that the Knitting Fates have heard us and decided to get involved. In lieu of a tutorial today, we have a rather impressive collection of FO’s, a couple new WIP’s, and the long-awaited renewal of our Skif KAL. I think I can identify two Habu yarns and maybe some Blue Heron Beaded Rayon… Again, if you knit this, we’d really like to hear about it! 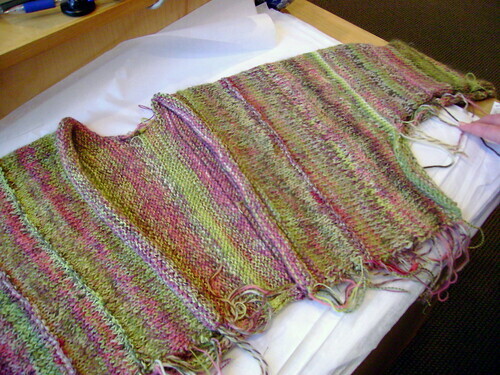 Love the color choices and addition of texture (purl ridges) – it already looks magnificent. Now, to be fair, the knitter in question was double-parked and ran in for just a minute to show Kristin her finished sweater (who wasn’t here, so I took a photo) – which meant there was no time for a project sheet. But we do know that the pattern came from Sweater Wizard and that the yarn is Blue Heron’s Bulky Rayon Chenille (it’s turning out to be a big day for Blue Heron) in the color “Island”. 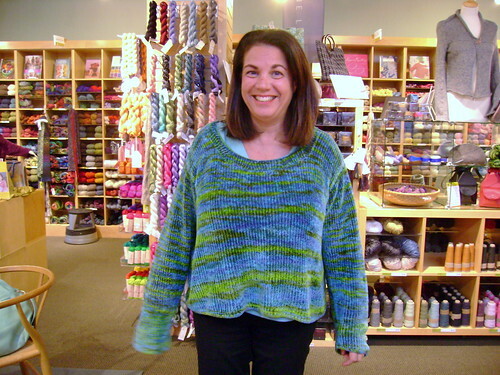 The sweater was super soft and comfy, and the knitter has enjoyed it so much that she’s decided to knit another pullover just like it – well, with slightly shorter sleeves. 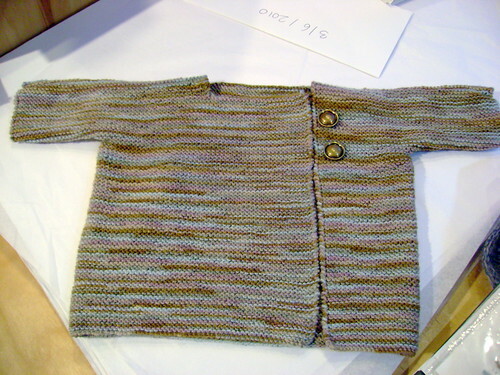 The pattern is Kristin Spurkland’s best-selling Vintage Baby Cardigan, and the yarn is ShibuiKnits Sock in “Pebble”. Personally, I love her color choice and the buttons. It’ll work for a boy or girl, which means it will definitely be used more for longer – something all knitters can appreciate. Lindsay’s is the Earth (we think she likes the neutrals) and Marj’s is in Zinnia. Too cute! The socks are for Tika. Remember Tika? Well, her chemo has gone extraordinarily well and she’s scheduled for surgery tomorrow. I’m hoping to have these ready (remember, the photos are from yesterday!) for her as a “Get Well Soon” gift in post-op. Well, Farrah will have them for her. I’ve been knitting feverishly and only have a couple of inches left on the leg/ cuff. 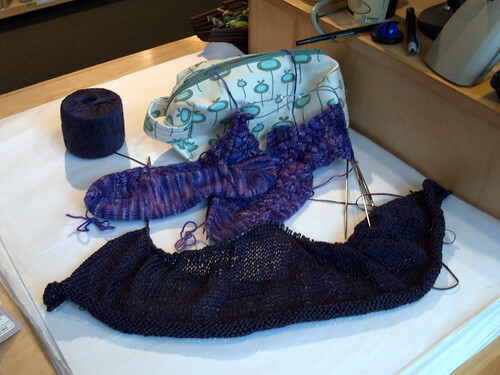 The giant eggplant rectangle is my in progress Skif Jess, being knit with the Skif cotton yarn (yum!). Maybe it’ll start looking like a sweater soon… One can only hope. I do have to say, though, that I really do love working with the yarn – it creates the most interesting, almost meshy, fabric. Very neat. Which segues very nicely into the fact that we are resurrecting the Skif KAL. And plan to come to our Skif Cast On Party! It’s gonna be awesome. Sandy Kay, Marj, and I are gonna be there and help you get your Skif on in style. We’re also going to have a Sew Your Skif Happy Hour later in the month (look for it on the website later this week) to make sure all of our KAL participants can finish their sweaters without difficulty. Now that is everything. 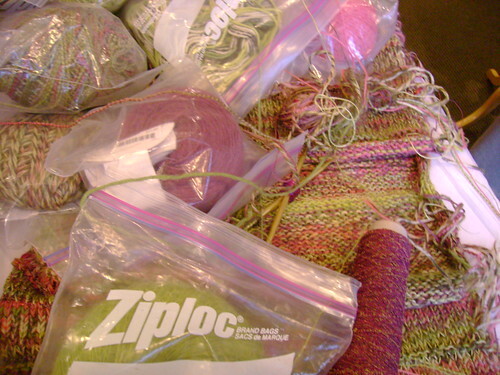 Until tomorrow, in which we really, really hope to make a tutorial, happy knitting! 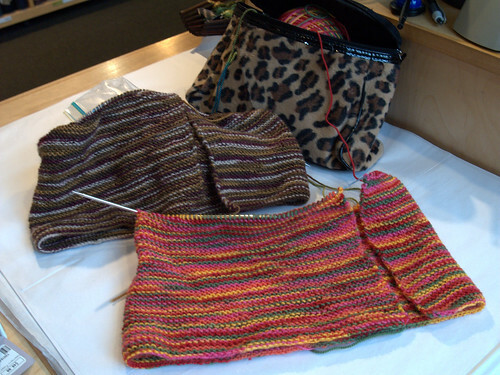 The post Halfsies and Getting Skif’d appeared first on Knit Purl Blog.